Start your mornings right with a beautifully appointed breakfast table. Fresh juice tastes so much better when served in smart vintage glassware. 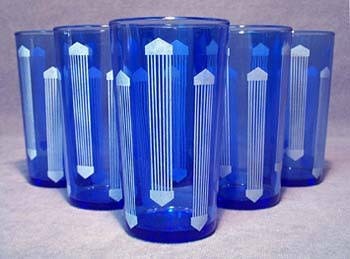 This matching set of six juice tumblers is made of a lovely shade of blue glass, adorned with white columnar decals. There are no chips or cracks in the glasses, and all the decals are in good shape. These glasses are in excellent condition.